Charles University, the renowned and historic institute of learning in Prague, and the City of Prague award the international Charles IV Prize to such international figures in the world of science, literature, and the arts, or other fields of human activity, whose work clearly expresses a global orientation and sense of responsibility for fate and future of humankind. 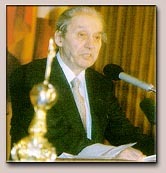 The Prize has been awarded once every two years since 1993. The traditions of Czech learning and the European significance of the city of Prague inspired the idea of establishing such a prize in the name of Charles IV, the medieval King of Bohemia and Holy Roman Emperor who by his founding acts in 1348 raised his city of residence to a status worthy of the universal imperium and established there the first university in central Europe. One of the most distinguished philosophers of our time. Paul Ricoeur has been best known for his attempt to combine phenomenological description with hermeneutic interpretation. In the course of his career he has written extensively on a broad range of issues including ethics, psychology and meaning of philosophy. Great German physicist and thinker, student of Niels Bohr a Werner Heisenberg, author of number of discoveries in nuclear physics. As a philosopher Carl von Weizsäcker has been particularly interested in relations between theology and philosophy and has been turning his attention to ethical issues of scientific research. Famous Russian exile cellist and conductor. 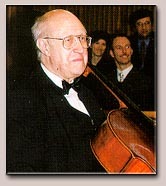 Mstislav Rostropovich also enjoys world-wide reputation for his contributions in defence of human rights and artistic freedoms. Rostropovich, the winner of the International Competition at the Prague Spring Festival in 1950 ran into a conflict with the Soviet authorities. He was finally allowed to revisit his home country in 1990. 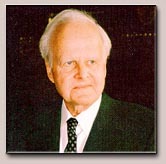 He also became an honorary citizen of the city of Prague in 1991. One of the greatest pianists of this century. He studied piano at the Prague Conservatory and the Prague Music Academy. 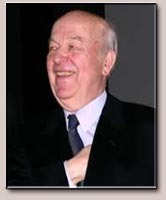 Ivan Moravec has performed all over the world; some of his concerts have also taken place in the famous Carnegie Hall. 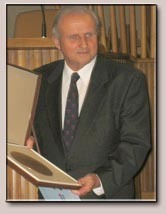 In October 2000 President of the Czech Republic awarded Ivan Moravec the Medal of Merit for outstanding artistic achievement. John Foxton Ross Kerr, Emeritus Professor of Pathology at the University of Queensland – Australia. While studying diseases of the liver, he discovered an unusual form of liver cell death that he initially named 'shrinkage necrosis', later renamed 'apoptosis'. This type of cell death is important in the treatment of a number of serious diseases and knowledge of the biochemical processes involved in apoptosis might lead to new more effective therapeutic methods. Professor Kerr has received numerous awards for his pioneering studies, including Bancroft Medal awarded by the Australian Medical Association (1993) and Paul Ehrlich and Ludwig Darmstaedter Prize (2000).